If I just got one famous client for this new service business, I’d have enough connections to get clients forever. 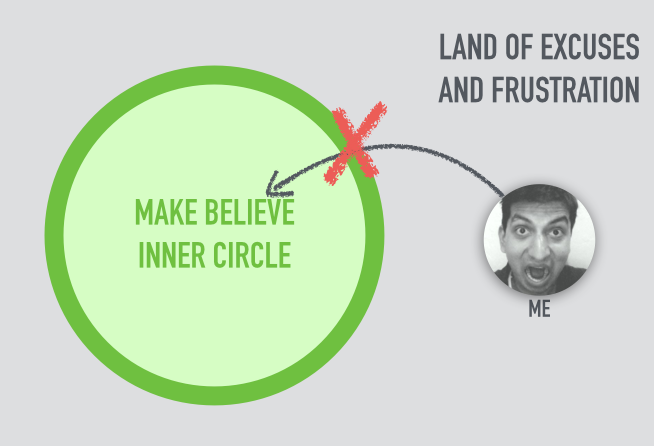 My unhealthy idea of not being able to penetrate a fictitious secret inner circle of successful people. Talk to any successful entrepreneur though, and they’ll tell you that’s not unusual. Starting is hard. You have to deal with The Struggle. That’s why “How did you get your first 100 users?” is a question Eric asks almost all his interview guests. And that’s why the first “Growth Takeaway” in his 9 Growth Takeaways e-book is about starting. Starting any business and getting your first few customers can be tough even if you’re already successful and have a deep network, but it’s even harder if you’re not famous and have limited “connections”. So how did I recently get 3 out of my first 3 cold emails to respond and eventually hire me for a brand new service business, including Eric Siu? I’ll show you exactly how I did this, including my exact email, word for word. But first, we need to introduce the basic strategy. My basic strategy was simply this: I sent a cold email with a ridiculously thorough, uniquely personal set of ideas in it, presented in a clear and personal way, so they simply couldn’t ignore me. The Basic Strategy: Be the green email. Charlie Hoehn wrote an entire e-book about how he got to work for famous people by doing free work that’s actually valuable to them. This advice is easy to skim over and promptly ignore. “Yeah yeah, add value, got it.” But getting this right can be the difference between up-leveling your growth versus being caught in a cynical “the world is cruel” cycle. Let’s dig into how to do it right. Cold email I got. Too long, too generic. I’ll save you the trouble of reading it: He wants to write a guest post about saving money in college. He has expertise in it. My blog was for students, so it’s relevant. In theory, that’s valuable. Surely college kids want to save money. But here’s the thing, to a busy person, it’s not valuable enough. Why? Because it’s generic. It doesn’t stand out. Busy bloggers get pitched guest posts every day. This well meaning guy simply doesn’t do anything to really stand out. Outline 3 post ideas with sub-bullets for each. Name drop high end blogs that he has written for and put me in the same category. Any of those would have made me raise an eyerbow, but he didn’t do them. It was clear his email was generic. Remember, valuable and unique. Now let’s look at my email to Eric that got me hired in a week. I was pitching A/B testing (or “split testing”) websites to increase conversions. Split testing is a hot trend right now. With the rise of “lean startup” and “growth hacking” everyone wants to split test and measure their growth. And with online tools like Optimizely available, really anyone can do it. I also knew that bloggers value email subscribers more than anything else because that’s the best way to connect to readers (and sell products). So when my friend and mentor, Bryan Harris of Videofruit, mentioned that his email opt-in rate is the most important metric in his business, he knows he could split test pages to increase his opt-in rate, but doesn’t have the time to do it and would happily pay someone to do it for him, I knew there was a service business there. Getting Bryan as a client was as easy — he knew who I was. But how would I get others? Enter the cold email. But I didn’t want to email just any blogger, I wanted to email bloggers that were making money and/or had connections. In other words, the busy ones that would probably ignore my email. Sigh. 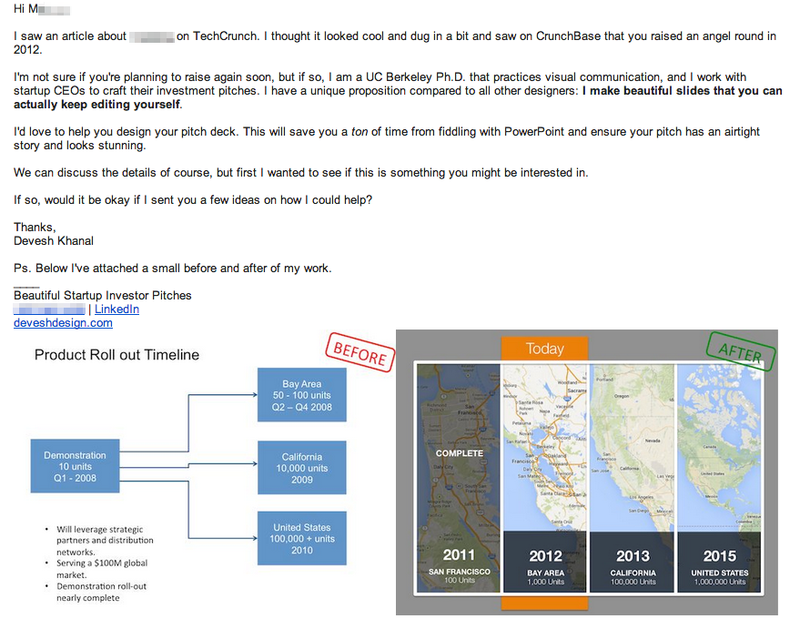 Enter the stand-out, over-the-top, too-awesome-to-ignore cold email. I thought of other blogs that could use a similar service and Growth Everywhere seemed like a good candidate. But I didn’t have a warm intro to Eric, and I didn’t have any testimonials from famous clients. To make it even harder, Eric doesn’t just blog at Growth Everywhere, he’s the CEO of a major marketing firm and is super busy. Aye! If I just sent him an email that said “Hey Eric, I do conversion optimization, can I optimize your site?” I might get a response, but who knows how many emails he gets like this every day. I didn’t want to leave it up to chance. With no connection, no referral, and no massive prior success to point to, I had only one choice: show him step by step how he could improve conversions by split testing specific elements of Growth Everywhere. In other words, add massive value by just doing some of the work before hand, and send him an email he can’t ignore. My exact email to Eric that got me a paid contract in 1 week and multiple more in a few months. Note the messed up formatting. Here’s the stand out part: Instead of just saying “Can I optimize your site” I recorded a screencast of me walking through Growth Everywhere and showing Eric step by step how I (or he) could improve his conversions by split testing specific areas of his site. My job was to stand out from every other cold email he got with something that was specifically useful to him. So I gave him a personal consultation about his site. I made annotated screenshots of specific pages of his site. I made a custom presentation. I walked through exactly what parts he could test. After I got him thinking “I really should do this” I showed him a way he could have it done without dealing with all the grunt work. That’s right, I just gave away my ideas in the video. In theory, he could have watched the video and done them himself and seen results (I’ll talk about why he didn’t later). Who does this? Nobody. That’s why it stands out. For most people, this is the first thing they would do after they got hired. I did it before. I don’t talk about myself and my background and my career aspirations No one cares. It may sound rude, but if you got 500 emails a day, could you really dig into the backstory of every sender? It’s just not possible. I don’t link to a website or even a LinkedIn profile. This isn’t a bad idea, but it pales in comparison to the credibility you get from actually doing valuable work. And it doesn’t help pass our uniqueness test: everyone has a website with a portfolio, everyone has a LinkedIn profile. I don’t lay out all of my recommendations in a massive email for him Long emails get ignored. Instead capture their attention with a short email and attach an unforgettable “free work” sample they just have to click on. I don’t talk about cost, price, selling, or anything related to money Don’t talk about money in your first email to a stranger. Don’t even say “I’ll do this at first for free” or something like that. Just get them to respond. If they like you and want your product, money talk will naturally arise. I don’t have fancy formatting In fact, something wonky happened in Gmail when I copied and pasted the text over from my text-editor and the formatting got all screwed up. Oh well. Goes to show that formatting doesn’t matter when the content is valuable. The very first thing he did was thank me for the email! Apparently it was clear that I didn’t just fire off 50 of these emails in a day; it took time and effort to think through my recommendations for Growth Everywhere, create the video, and send it. And he’s right, it did take time. And if that weren’t enough, he said it stands out and asked if he could use the video in a blog post (which is the post you’re reading now). So far I’ve sent 6 of these emails out, have a 100% open rate, an 83% click on video rate (5 out of 6 watched the video), and got 3 deals out of it (50% deal rate). My poorly performing old email pitch for a different service. Out of approximately 100 of these emails, I got a 16% response rate and a 0% successful deal rate. That’s right out of 100 emails, not a single company wanted to hire me to design their presentation. But, for three companies, I found their own presentations, redesigned their own slides, and sent it to them. For those 3 emails, which took a lot longer, I got a 100% response rate and got one deal that’s turned into a great relationship. All this from 3 emails. But isn’t this a lot of work? Yes it is. That’s the catch. But the good news is that means it will continue to make your emails stand out, because most people won’t put in the effort. I didn’t time it exactly, but the pitch to Eric took me a few hours in total. Not 20, and not 1, but maybe 5 – 7. It’s a good chunk of time for a cold email, but look at the result. Won’t some people run off with my ideas and not hire me? This is also possible. But if this is happening a lot, you’re not targeting the right people. Your ideal targets are ones who are successful and busy enough that they’d rather hire you to fix their problem than do it themselves. If you’re sending this to people that will do it themselves, they had a 0% chance of buying it from you in the first place. But this is not scalable! First, it’s actually more scalable than you think. You can outsource a lot of the repeat work if your service is high value enough. For example, I could train someone to compile a list of bloggers that match a criteria, create presentation templates with their brands, and leave only the analysis and video to me. But more importantly, we are not talking about scaling! We’re talking about starting. If you get a lot of traction, you can think about scale. But at the beginning you have to do things that don’t scale. If you don’t believe me, download Eric’s 9 Growth Strategies of Top Entrepreneurs e-book and checkout the 1st strategy, or check out this famous article from Paul Graham of Y-Combinator. Click here to get these bonuses. And finally, do you have interesting ways you’ve landed your first few customers? If so, tell us in the comments!